Your best value for mooring in southern Indiana! 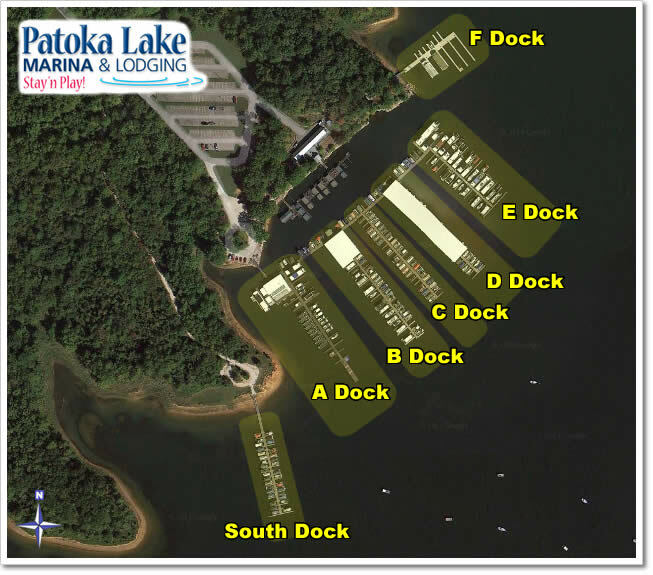 Patoka Lake Marina is located inside the Newton-Stewart State Recreation Area and is patrolled by DNR officers. Additionally, we have staff on hand to provide security and shuttle service, making our marina a safe facility. Please see store hours for shuttle service times. Our Floating Store provides hot and cold food for breakfast, lunch and dinner, as well as groceries, ice, soft serve ice cream, picnic supplies, bait and tackle, and a conveniently located fuel dock. At the fuel dock you'll find self-serve gas, pump out, and temporary slips available for overnight rental. All of our rental slips (except the temporary slips) are double-sided, so you have two sides to tie off your boat, and you can access your boat from both sides. Slip utilities include water, sewage, and metered electricity. Call us for Yearly Slip & Seasonal Buoy rentals! Click here for info on dry boat storage. A wide variety of slips and buoys are available for rent. All slips (except guest slips) are double sided. Some slips big enough for houseboats, floating cabins and cruisers. Floating shower house also has FREE laundry facilities. 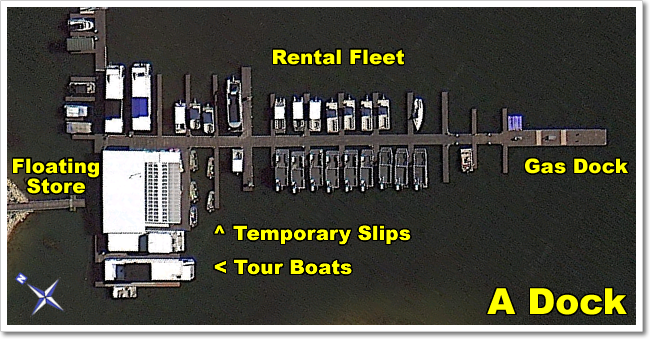 A Dock houses the Floating Store (with all your last minute needs), the temporary slips, our fleet of rental boats, our tour boats, and the public gas dock. B Dock has 40' slips (some covered) on one side of the dock, and 24' x 12' slips (some covered) on the other side. C Dock contains all 24' x 12' slips. D Dock has 24' x 12' slips (some covered) on one side of the dock, and 28' x 12' slips (some covered) on the other side. E Dock has 40' x 17' slips on one side, and 60' x 17' slips plus 80' x 20' houseboat slips on the other side. F Dock houses private floating cabins and some 100' x 22' slips. South Dock has mostly 24' x 12' slips, plus a couple of 28' x 12' slips.